The bookstore part of Collected Works Bookstore & Coffeehouse, Santa Fe, N.Mex., is closed this week while new carpeting is installed, the final stage of a seven-week renovation, according to the Santa Fe New Mexican. The renovation includes a new, ADA-compliant bathroom; rebuilding of sagging flooring; and painting. The coffeehouse remains open, and the store intends to reopen fully this coming Saturday, March 23. All the changes "will brighten up the place," owner Dorothy Massey told the newspaper. "I think the store will be more attractive." The store is located in a building that housed the El Fidel Hotel when it opened in 1923. Massey, who bought Collected Works in 1996, moved it to the site in 2009. 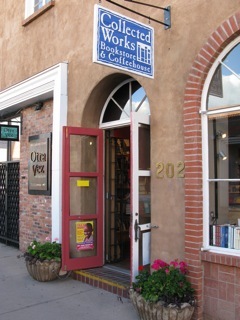 Collected Works was founded in 1976. Follett Higher Education Group will take over operations of Virginia Tech bookstores and some other services, including University Bookstore, Volume Two Bookstore, Dietrick Convenience Store, the North End Center Hokie Centric and North End Center Starbucks, as well as various websites, catalogues and stadium athletics stores, the Roanoke Times reported. Follett's agreement with Virginia Tech Services, which had run the operations since 1968, is effective for 10 years. "We look forward to a bold new retail operation aligned with the future of Virginia Tech," Donald Williams, executive director of Virginia Tech Services. "It is our mission to serve the students, faculty, and staff of the Virginia Tech community, and we will continue to provide retail services and revenue to Virginia Tech. The partnership with Follett Higher Education Group will support the continuing mission and vision of Virginia Tech and Virginia Tech Services." No employees will lose their jobs in the move. Of the Virginia Tech Services staff, 35 will shift to comparable jobs with Follett and four will be retained by Virginia Tech Services. The more than 200 student and part-time workers employed by Virginia Tech Services will also be retained by Follett, according to the university. In the next year to 18 months, several facilities will receive renovations and upgrades, including a new Starbucks at the University Bookstore on campus. At the annual general meeting of the Booksellers Association of the U.K. and Ireland, held last Tuesday during the London Book Fair, Tim Godfray, executive chair of the BA Group, reported that the number of independent bookshops in the BA's membership has risen and the BA now has more bookstore outlets as members than at any other time in its history. He also gave updates on three recent initiatives undertaken by the BA: Green Bookselling, Diversity & Inclusion and Professional Development. The Green Bookselling Task Force has been working with publishers to make the supply chain more ecologically friendly and is gathering sustainable best practices that booksellers can use at their own stores. To help foster diversity and inclusivity, the BA has established a grant fund to help members take on a variety of projects (more on that below). And in the realm of professional development, the BA is working to create a mentoring program, a booksellers network for newer members, and more ways in which booksellers can share best practices. Godfray added that the BA's efforts to bring Batch to the U.S. have met with very positive reactions, and in the U.K., the BA will soon roll out a Batch app for smartphones. On Wednesday afternoon, a group of British booksellers shared what they had accomplished with their grants from the BA's Diversity and Inclusivity initiative. Meryl Halls, managing director of the BA, explained that all three booksellers--Rachel Rogan, owner of Rogan's Books in Bedford, England, Fleur Sinclair, owner of Sevenoaks Bookshop in Sevenoaks, England, and Noor Hemani of Lighthouse Bookshop in Edinburgh, Scotland--were part of the first round of grants. Rachel Rogan used her grant to create a regular book club in partnership with a local LGBTQ youth group. Rogan had previously run a youth Pride weekend with the group and now works with publishers to bring in new titles for the book group. As part of the book group, Rogan gets the participating teens to provide reviews and feedback of new titles. At Sevenoaks Bookshop, Fleur Sinclair has run the equivalent of a YA advisory council since 2017, and with the help of the grant created a magazine to go along with it. It is created for and by children, and each participant is given a variety of journalistic roles. The money from the grant allowed Sinclair to bring in an editor-in-chief to guide the process and several others to help coordinate production. For each issue of the magazine, which is called Bookmark, Sinclair will bring in a new group of 14 or 15 children to put it together. In an announcement about the closing, Kinokuniya said, "We seek to consolidate and channel our limited resources for better deployment among our other business units." 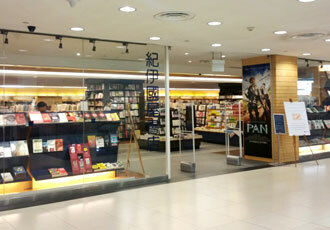 The 13,000-square-foot store offers 150,000 titles in English, Japanese and Chinese. The paper noted that "Kinokuniya's first customers in Singapore were Japanese expatriates, but the bookstore soon included English titles in its line-up of bestsellers, paving the way for its success here." 2019 NBA Judges: Make that Five Booksellers! In our story on Friday about judges for this year's National Book Awards, we omitted one of the booksellers. With deepest apologies, we want to note that Shuchi Saraswat, buyer and curator of the Transnational Literature Series at Brookline Booksmith, Brookline, Mass., is one of the translated literature judges. W.S. Merwin, "a formidable American poet who for more than 60 years labored under a formidable poetic yoke: the imperative of using language--an inescapably concrete presence on the printed page--to conjure absence, silence and nothingness," died March 15, the New York Times reported. He was 91. Merwin "was equally known for his work as a conservationist--in particular for his painstaking restoration of depleted flora, including hundreds of species of palm, on the remote former pineapple plantation in Hawaii where he made his home." One of the "most highly decorated poets in the nation, and very likely the world," Merwin was the U.S. poet laureate from 2010 to 2011; won two Pulitzer Prizes; a National Book Award; the inaugural Tanning Prize from the Academy of American Poets; the Bollingen Prize for Poetry; the Lila Wallace-Reader's Digest Writers' Award; the Ruth Lilly Poetry Prize from the Poetry Foundation; and the PEN Translation Prize, the Times noted. Merwin published nearly three dozen volumes of poetry, along with essays, short fiction, memoirs and translations of Dante, Pablo Neruda, Osip Mandelstam and other poets. His books include Garden Time; The Essential W.S. Merwin; The Lice; The Carrier of Ladders; The Shadow of Sirius; Migration: New and Selected Poems; The Moving Target; The Compass Flower; The Rain in the Trees; The Moon Before Morning; Unframed Originals; The Ends of the Earth; Summer Doorways; and The Lost Upland. 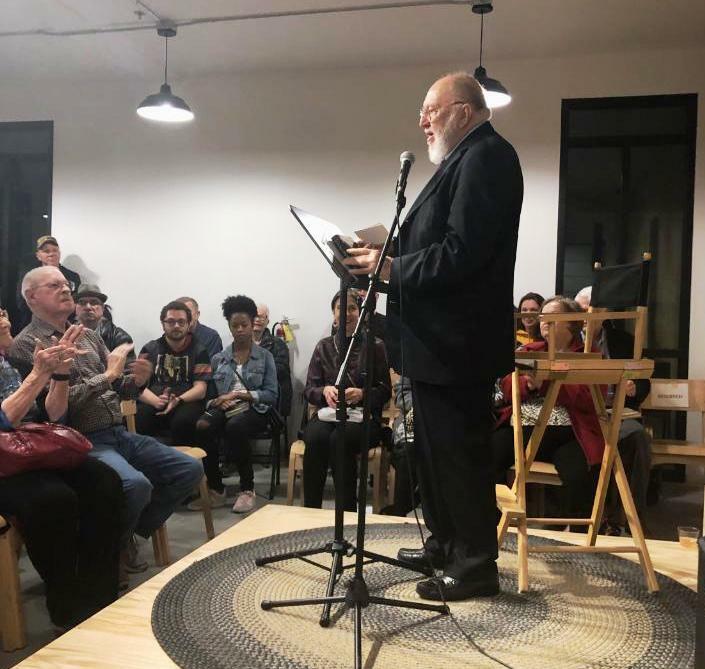 Michael Wiegers, editor-in-chief at Copper Canyon Press, Merwin's longtime publisher, said, "While we have lost a tremendous friend, the loss to American poetry is even more profound. From the stylistic inventions he introduced to the catalyzing force of his work in translation and international poetics, his influence on American poetry has been without equal." In a tribute posted on the Paris Review blog, Edward Hirsch wrote that Merwin was "a poet, a prose writer, and a translator. He was completely sure about his vocation. He was the most international of American poets, and the most down to earth, literally: he knew more about the natural world than anyone else I've ever known.... He was over 50 when he moved to Hawaii. He discovered it and it discovered something in him. He found a place, a way of being to believe in. I found the landscape too overwhelming to write in. He dug in--tending the land, tending his poetry.... William Merwin was an American original. He is like a great pine tree that has fallen. His work is going to live on, but I can't get over his loss." Filmmaker Stefan Schaefer, who made the documentary Even Though the Whole World Is Burning, shared out-takes from the film with the Merwin Conservancy showing the poet reading 12 of his poems. The Writer's Block in Las Vegas, Nev., which recently moved to a new location, hosted Nevada Newspaper Hall of Fame journalist and author A.D. Hopkins for his novel The Boys Who Woke Up Early (Imbrifex Books). Bard's Alley bookstore, Vienna, Va., shared a "sneak peek at the bench, painted by local artist Dore Skidmore, which will soon be a temporary fixture outside Bards Alley! 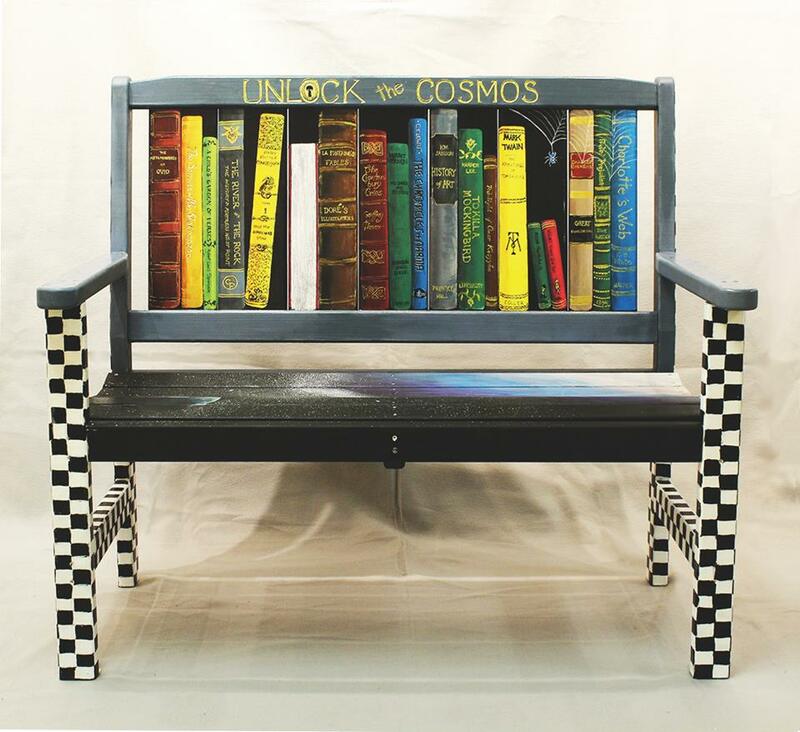 The work is part of the Vienna Arts Society's new public art display, 'Take a Seat, Vienna,' which begins in April and will continue through October 2019." That project, the Vienna Arts Society said, "has engaged a diverse group of Vienna businesses and community sponsors to feature 42 benches in our community, each of which is being painted with unique and original artwork by VAS members who are donating their time, expertise, and materials to this project." 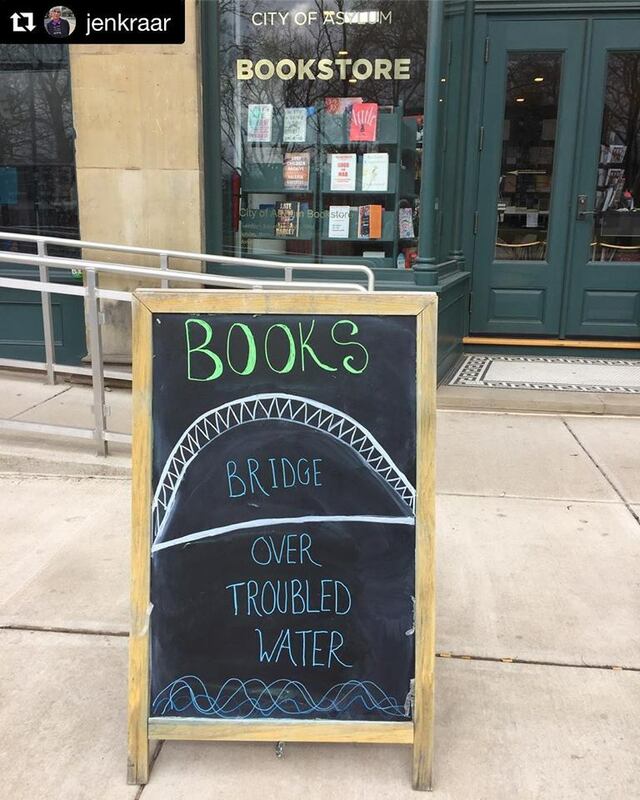 "Books: bridge over troubled water" was the message on the sidewalk chalkboard outside Pittsburgh's City of Asylum Bookstore at Alphabet City, which noted: "We couldn't agree more." Roxanne Jones has joined HarperCollins as a senior publicist for Harlequin's MIRA Books, Park Row Books, and Hanover Square Press. She was formerly a publicist at Berkley. 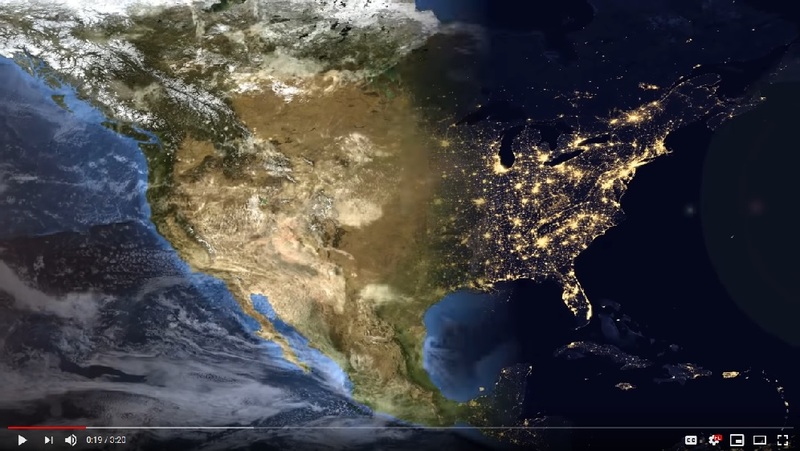 America Before: The Key to Earth's Lost Civilization by Graham Hancock (St. Martin's Press). CBS This Morning: Preet Bharara, author of Doing Justice: A Prosecutor's Thoughts on Crime, Punishment, and the Rule of Law (Knopf, $27.95, 9780525521129). He will also appear tomorrow on the View. Fresh Air: Homer Venters, author of Life and Death in Rikers Island (Johns Hopkins University Press, $26.95, 9781421427355). Jimmy Kimmel Live: Karamo Brown, author of Karamo: My Story of Embracing Purpose, Healing, and Hope (Gallery, $27, 9781982111977). Late Show with Stephen Colbert: Vicky Ward, author of Kushner, Inc.: Greed. Ambition. Corruption. The Extraordinary Story of Jared Kushner and Ivanka Trump (St. Martin's Press, $28.99, 9781250185945). CBS This Morning: Harlan Coben, author of Run Away (Grand Central Publishing, $29, 9781538748466). Also on CBS This Morning: Evan Thomas, author of First: Sandra Day O'Connor (Random House, $32, 9780399589287). Today Show: John Alberti and Tony Alberti, author of Twintastico Italian Cooking at Home with the Alberti Twins (Pelican Publishing, $24.95, 9781455624430). Jimmy Kimmel Live: Senator Kamala Harris, author of The Truths We Hold: An American Journey (Penguin Press, $30, 9780525560715). Late Night with Seth Meyers: Action Bronson, co-author of Stoned Beyond Belief (Abrams Image, $27.50, 9781419734434). Cooper Waterman, principal at Waterman Entertainment and Riven Rock Projects, and producer Matthew Phelps "are moving into the action-thriller space with the acquisition of Steve Berry's Cotton Malone book series, which they are developing as a potential TV series," Deadline reported. The 14th title in the series, The Malta Exchange, was released March 5. "It's been a dream of mine to see Cotton on the screen," said Berry. "These folks have an impressive vision, and I look forward to seeing that vision come alive." In a joint statement, Waterman and Phelps commented: "Steve Berry has created a character in Cotton Malone that tens of millions of readers around the world have fallen in love with, and we are honored to be able to adapt his life's work into an iconic international crime thriller." Frederick Douglass: Prophet of Freedom by David W. Blight (Simon & Schuster), which judges called "a definitive portrait." Our Beloved Kin: A New History of King Philip's War by Lisa Brooks (Yale University Press), which "imaginatively illuminates submerged indigenous histories." The shortlisted titles of the Reading the West Book Awards, sponsored by the Mountains & Plains Independent Booksellers Association and honoring "the best fiction, nonfiction, culinary writing, and books for young readers written by an author living in or writing about the region, or books that celebrates the spirit of the West" have been selected and can be seen here. Readers and book lovers are encouraged to vote for their favorite shortlist titles online. Winners in the six categories will be announced on April 15. 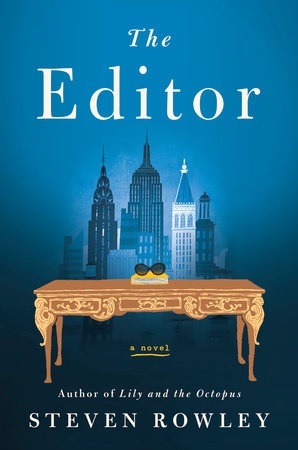 Steven Rowley (Lily and the Octopus) explores the complicated relationship between mothers and sons in his wise and deeply engrossing second novel, The Editor. Set in Manhattan in the 1990s, the story centers on James Smale, an aspiring writer in his late 20s, who has worked "a never-ending string of toxic, depressing temp jobs" and is in a committed--although maybe not forever--relationship with Daniel, a loving and spirited companion who works in the theater. Onassis selects only manuscripts that deeply resonate with her, and James's story fills the bill: "Books are a journey," she explains. "And I'm always excited to embark on a journey I haven't taken before. So I wanted to meet you." During their brief meeting, James is star-struck, while Jackie steers the conversation toward details of James's story--in particular, the character of the mother in his novel. Is she based on James's own mother? As Jackie and James acclimate to each another, the moment marks the start of a working relationship that will later turn into friendship. But before that happens, there's hard work to be done. Jackie is sold on James's book, but feels it "needs polishing," and the ending needs an overhaul. Perceptive, analytical and astute Jackie becomes a literary mentor to James. She also raises questions--on the page and off--that gently nudge James to dig deeper into the emotional landscape of his fraught relationship with his mother and the rest of his family. Rowley imaginatively casts Jackie beyond her larger-than-life, romanticized persona as an ordinary, hardworking woman dedicated to books, the arts and a quiet search for meaning and purpose. Over the course of honing and rewriting the end of his novel--and trying to overcome writer's block and better understand his story and his life--James spends quality time with Jackie in her office and her Fifth Avenue apartment and even visits her home on Martha's Vineyard. In peeling back layers of Jackie-beyond-the myth, James also unveils startling truths about himself and his identity, along with his mother and the relationship they share: the turmoil of the past, secrets kept, sacrifices made and confrontations needed to facilitate healing and a measure of peace. Shelf Talker: In this refreshing, imaginative novel of self-discovery, a debut author has his work--and his life--edited by the inimitable Jacqueline Kennedy Onassis.